Peter Hide: For this exhibition I wanted to show some sculpture from the 1970s, the period when the Stockwell Depot was really very active, but also some subsequent work from Canada, so that the show would be a sort of thirty-year snapshot. I also wanted to exhibit here in London because I still feel British, English particularly, but feel a bit like I’m a ghost when I come back here, as if I don’t really exist here in any palpable way. I come back every year and make sculptures, but I make them in a remote place in the countryside and so they're not widely seen. Jon Wood: Do you now see the ‘Stockwell Depot period’ as carrying with it a specific sculptural style that preoccupied you before you moved to Canada? Peter Hide: It was a transitional period. I started the 1970s as a kind of English minimalist with concerns not that dissimilar to, say, John Panting. I made heavier, weightier stuff, but was concerned with how metal deformed under stress. Eventually I found this to be a rather arid pursuit - all in the design really - and I wanted to get back to a form of sculpture where the making of it was a pleasure, a journey and a discovery. I’d gone into minimalism to escape from Anthony Caro’s influence, but I hadn't really got away and discovered myself as a sculptor. I’d concocted originality, if you like: I felt my original sculptures were ‘concocted originality’. So the 1970s was a period of evolution. 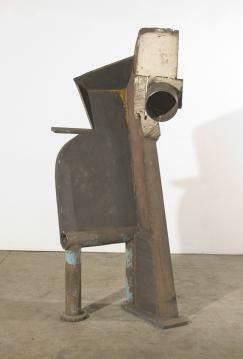 Another important influence was the work of Michael Steiner, a young American sculptor. Jon Wood: Can you say what it was about Steiner’s work that made it so compelling for you then? Peter Hide: Steiner showed an alternative to Caro. He started as a minimalist too, making minimalist boxes a bit like Donald Judd’s, and he found a way to develop a spontaneous use of volume within abstract terms, within improvised sculpture. So he had a much more volume-conscious approach to sculpture and showed how a truly monumental sculpture could be made using what you might call cubist-derived form. Caro’s sculpture didn’t lend itself naturally to the monumental and it didn't lend itself to weightiness - in fact Caro was interested in weightlessness. So through sensibility and inclination, I was much more interested in weight, volume and a more heavy form of sculpture, and Steiner showed me the way initially. Jon Wood: What is the charm of weight for you? Peter Hide: Weight is a condition of sculpture, and sculpture has to defeat gravity in order to exist. You can make sculpture that’s not about weight or that creates the illusion of weightlessness, but I wanted to make sculpture that acknowledged and emphasised its weight. Looking back I think it suited my sensibility to go for the monumental, for the heavy, for the massive. I didn’t have a feel for delicate placement and calligraphics, nor was this really where my interests or strengths lay as a sculptor. It’s interesting to note that my first really powerful experience of making sculpture was as a wood carver, under the influence of Barbara Hepworth. This carving sensibility stayed with me and gradually reasserted itself in the somewhat unlikely context of my steel sculpture. Jon Wood: I've heard you call big, heavy sculptures ‘bruisers’, which is an interesting choice of word. Peter Hide: I think that as young artists, we wanted them to be macho, heavy and dense. though it’s nothing if you’ve just got weight. It has to have psychological power to go with it. I think in the mid- to late-1970s we all got obsessed with massiveness, the sculpture from the body - the forging was about a concentration of weight and mass in sculpture, but it was also about creating three-dimensional forms that were organically formed. It was a rebellion against constructed sculpture and we were all looking for a way out from the pictoriality of Smith and Caro, as much as I admire both of them. Jon Wood: Is there a particular sculpture in the exhibition that for you demonstrates your liberation from Caro’s sculpture? Peter Hide: I have a sculpture in the show called Seven Sisters which is a vertical monolith. There is no negative space in it, there's no see-through space and it’s made with various kinds of pleating, a sort of vertical pleating and a horizontal pleating. It looks a little like a staircase or an ascending tower. Jon Wood: What about your sculptural sensibility and sculptural imagination today? Peter Hide: Well, it’s hard to talk about the present, but I’m interested in simplicity. Jon Wood: What do you mean by that? Peter Hide: Well, for instance, a sculpture I might have made in the 1980s might have had seventeen elements, whereas now I might try and make a sculpture which has three or four elements. They might be complex elements, but would have a far greater effect of simplicity. Jon Wood: What about your interest in materials today? Peter Hide: I’m very interested in exploring the character of steel as a softer, more organic material. I am interested in exploring different feelings in steel - decay, decomposing or dissolving forms and fragmented, torn surfaces. As I’ve grown older my interest in what I want to get out of sculpture is now not perhaps so ‘heroic’. I’m interested in the way steel rusts and when the surface literally dissolves into rust, and becomes more elusive. Jon Wood: What does rust mean to you? Peter Hide: I’ve thought about that before and find it very difficult to answer exactly. To some degree it might be about aging or mutability – more about an interest in metamorphosis than classicism. Jon Wood: But if you're really interested in aging and mutability, why are you making solid, heavy, welded metal sculpture? Peter Hide: I tend to think sculpture is a sort of attempt to defeat death, an attempt to leave something immutable behind, and a sculpture is perhaps a protest against death. But it’s also nice to be able to deal with things that seemed to me, as a younger artist, to be outside the reach of sculpture. Jon Wood: But in our multimedia world today there are all kinds of ways to try to cheat death - why for you is abstract metal sculpture the best route to do that? Peter Hide: Most of the forms offered by modern technology seem extremely ephemeral, so I wouldn't be very confident that anything I put on a CD electronically would last more than the next five years. I think sculpture is like dance; as long as we've got bodies we’ll make sculpture. Jon Wood: So as long as we have bodies, will we need abstract sculpture? Peter Hide: Funnily enough, I sometimes wonder whether my sculpture isn't actually rather difficult and that its spatial complexity is difficult for people to understand. Perhaps it’s not that I’m a dinosaur hanging on to steel sculpture or that I’m a sort of old colonel from Tunbridge Wells or something, but that I’m doing something that people actually find very difficult to grasp. I sometimes notice curators come into my studio and stand at the side of my sculpture and say ‘It’s beautiful’, and walk away - meaning that they haven't really ‘got’ the sculpture and don’t understand where the important view is. I think that the public generally are still a little bit baffled by abstract sculpture - they don’t know how to approach it. I mean, on the very simplest level, a painting hangs on the wall so you know how to address a painting. You might not like it but you know that you stand in front of it and that you don’t stand too close perhaps. But with a sculpture, especially with an abstract sculpture (in which autonomy is emphasised), people want to know what it represents and where the front is…So abstract sculpture defeats your expectations, it gives you a complex spatial situation which isn't found in functional architectural machines or in nature.